Research grants issued by the National Institutes of Health (NIH) contribute to a significant number of private-sector patents in biomedicine, according to a new study. The study, published in the journal Science, examines twenty-seven years of data and finds that 31 percent of NIH grants, which are publicly funded, produce articles that are later cited by patents in the biomedical sector. “The impact on the private sector is a lot more important in magnitude than what we might have thought before,” says one of the researchers. Research grants issued by the National Institutes of Health (NIH) contribute to a significant number of private-sector patents in biomedicine, according to a new study co-authored by an MIT professor. The study, published in the journal Science, examines twenty-seven years of data and finds that 31 percent of NIH grants, which are publicly funded, produce articles that are later cited by patents in the biomedical sector. “The impact on the private sector is a lot more important in magnitude than what we might have thought before,” says Pierre Azoulay, a professor at the MIT Sloan School of Management, who is one of the authors of the paper. After reviewing over 365,000 grants — making this a uniquely large study — the research also finds that over 8 percent of NIH grants generate a patent directly. Intriguingly, the researchers also find no significant difference between “basic” or “applied” research grants in terms of the frequency with which those projects helped generate patents; both kinds of research spill over into productive private-sector uses. The paper, “The Applied Value of Public Investments in Biomedical Research,” is co-authored by Azoulay, who is the International Programs Professor of Management at MIT Sloan; Danielle Li PhD ’12, an assistant professor at Harvard Business School; and Bhaven Sampat, an associate professor at Columbia University’s Mailman School of Public Health. 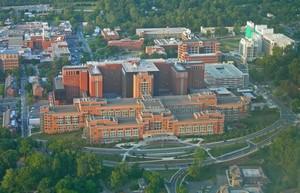 The NIH, which has its main campus in Bethesda, Maryland, encompasses multiple research institutes and is the world’s biggest source of public funding for biomedical research, dispersing about $32 billion annually in grants. To conduct the study, the scholars examined 365,380 NIH grants funded between 1980 and 2007 — nearly every NIH grant awarded for decades. Exactly 30,829 were the direct basis for patents; 17,093 of those were so-called “Bayh-Dole” patents issued to universities and hospitals, something federal legislation made possible starting in 1980. Of the NIH grants, 112,408 were additionally cited in a total of 81,462 private-sector patents. Azoulay, an economist who studies the production and dissemination of scientific knowledge, says the bottom-line figures in the study — the 31 percent and 8 percent of NIH grants that contribute to and more directly generate patents — strike him as being significantly large because of the broad scope of research the NIH supports. “There is a lot of research we wouldn’t necessarily expect to be relied upon in a patent,” Azoulay explains. He also noted that such research can be characterized as either “basic” or “applied”; the researchers found little difference in the long-term patent-creating productivity of those categories. For instance, some research projects can be considered more directly “disease-oriented” than others, but even by this yardstick, the frequency of patent generation does not vary greatly. About 35 percent of “disease-oriented” NIH grants led to patents, compared to 30 percent otherwise. Overall, Azoulay says, the flow of knowledge from NIH research projects to the commercial market seems clear. The current project is one of multiple related studies that Azoulay and his colleagues — including Li, who will join the MIT faculty in July 2017 — have conducted on the impact of publicly funded science. A 2015 working paper released by Azoulay, Li, Sampat, and Joshua Graff Zivin, a professor at the University of California at San Diego, estimated that every $1 of public NIH funding yielded between $1.5 and $2 in private-sector pharmaceutical drug sales. That study is still undergoing peer review. The current research was conducted partly with the support of the National Science Foundation’s Science of Science and Innovation Policy program (SciSIP).